Mould, Stain, Water and Fade Resistant! 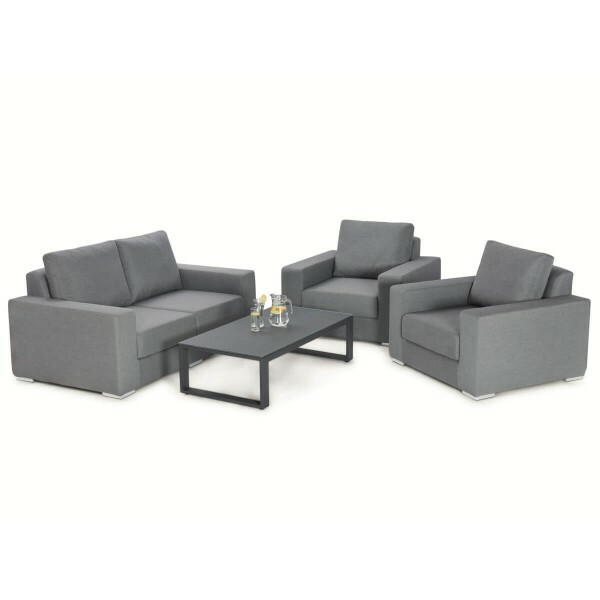 Why Choose the Zen 2 Seat Sofa Set? The Zen 2 Seat Sofa Set brings the wow factor and superior comfort to the garden, the sofa set with generously sumptuous cushions make this a very popular set for relaxing outdoors in the summer months. The Zen 2 Seat Sofa Set includes a two seater sofa, two sumptuous armchairs and a square acid etched coffee table. Whether you're having friends over for a party, having a barbecue with family or just enjoying in the sunshine, the Zen 2 Seat Sofa Set from Maze Rattan Furniture will allow you to relax in the utmost comfort this summer. The Maze Outdoor Fabric range consists of ground-breaking products that bring home comforts to the outdoors, so be one of the first to revolutionise your garden. If you're tired of storing your cushions away, then this is the perfect set for you as the low maintenance furniture is weather-proof so it can be left out all year and still keep that "brand-new" look. This exciting new range will transform the conventional views on garden furniture. As with all Maze Rattan products, it is made from the highest quality materials; a lightweight aluminium frame, enveloped by quick-drying foam and topped off with water, stain, and fade-resistant fabric. Maze Outdoor furniture begins with a lightweight rust-proof aluminium frame, which is cushioned by reticulated extra-open celled foam allowing maximum water-drainage and air flow permitting faster results. The Sunbrella™ fabric is dyed when the acrylic is still in liquid form so the colour permeates to the very core of the fibres and the vibrancy refuses to fade. Advanced High performance foam that is designed specifically for outdoor cushions and furniture. The porous open-cell structure allows water to drain rapidly and fresh air to circulate freely. After a heavy downpour and in good weather conditions, the furniture is ready to use again within the hour. Each set is finished off with a world leading powder coating that ensures a colour that retains its brilliance for years – even through some of the harshest weather. Our products boast a lasting high-end look with minimal effort, you can easily preserve your furniture with a soft-bristle brush and soapy water, or for those more stubborn stains, this is the only fabric that can be cleaned with diluted bleach, by adding 50ml bleach per litre of water, simple rinse after and air-dry.